With passenger and cargo traffic expected to grow by around 5% per annum for at least the next 15 years, demand for new and updated airports has arguably never been so high. Planners have, of course, many issues and stakeholders to take into consideration when building a new airport or renovating, modernising or expanding an existing facility. Among other things this means that an airport’s layout must be purposefully planned and designed to support an array of carefully balanced services and facilities from landside to airside and from customer-facing areas to the backend. An airport’s location, customers (airlines and passengers), peak travel times, stakeholder interests and construction budgets are among many variables in planning a new or renovated airport. Louis Berger’s global footprint has allowed us to participate in some of the world’s most dynamic airport constructions and rehabilitations – each mandating a unique approach to airport master planning. And experience has taught us many lessons in how to plan, design and build airports that operate safely and efficiently. They include the fact that airport planning requires a specific fit that will meet the 21st century needs of users and stakeholders. Below are some of the lessons we’ve learned over the years from aviation assignments in nearly 80 countries. A first planning step is to assess the new or updated airport’s profile. Is it located in a tourist destination that mainly serves leisure travellers? Is it likely to be used mostly for business passengers? Is it a mix of both? Is the airport a hub or a destination airport with relatively few connecting flights? An airport in a tourist destination, such as Jamaica’s expanded Sangster International Airport, is likely to have most passengers arrive and depart in charter buses and hotel shuttles, affecting kerb lengths and check-in counter queues. Tourist airports have – in general – less busy periods throughout the day, causing higher peak hours and generally requiring expanded areas in passenger processing facilities. The volume of tourists’ luggage may exceed that of business travellers, a consideration in baggage handling systems and facilities design. Geographic location matters, too. In South East Asia, for example, passengers carry a lot of luggage, whereas in the US, checked bags are statistically substantially lower. As a result of the regional differences, hubs like Bangkok Suvarnabhumi typically accommodate a lot of baggage transfers. It therefore requires robust baggage handling facilities as well as a clear directional visual information system and easy to navigate circulation areas to facilitate the flow of passengers on connecting flights. Annual, seasonal and peak hour passenger and cargo forecasts also are needed. An airport’s traffic is affected by its country’s gross domestic product, the market profile of the region, accommodation capacity in the vicinity and whether it has significant hub traffic. Forecasts help determine an airport’s size and projected lifecycle. 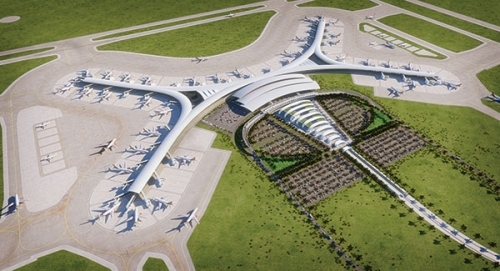 In Yucatan, Mexico, Louis Berger performed traffic forecasts for the new Riviera Maya Airport, accounting for likely growth in hotel and other tourist accommodations through 2025. Air traffic forecasts were established for the new airport as well as for the existing Cancún and Cozumel airports during this period, keeping in mind potential competition between them. Our analysis included passenger traffic, cargo volumes, aircraft movements and peak travel times. Determining peak travel times is essential in the sizing of an airport. Tourism destinations can have the most pronounced peak hours, correlating with hotel check-out times and/or the most desirable departure times from their primary originating markets. A hub airport also tends to have pronounced peak hours as operations are concentrated to facilitate flight transfers. An airport used largely for business travel can also have marked busy periods, generally early or late on weekdays. Use of an airport also can vary by season, notably in tourist destinations. These airports may need a more flexible layout to accommodate partial closures – if needed, and operationally feasible – during off-season to save on staff and utility costs. Peak travel forecasts will dictate the number of gates, the size and design of passenger processing areas, airport and terminal systems, and other facilities. Airport use patterns also can impact concession space to be provided in addition to the general layout and type of offerings. We use time-tested programming tools and schemes to forecast airport traffic and establish the best airport design and size. Because numbers only tell half the story, our analysts ensure that figures are being applied accurately and comprehensively. That not only goes for how the traffic forecasts impact the airport terminal design, but also the airfield, taxiways, cargo facilities, warehouses and other buildings and support facilities onsite. There must be a balanced relationship between the size and capacity of the airport terminal and other services and facilities. Another step in airport planning is to compare projected demand to capacity. We look at the passenger processing times and how many people can be accommodated in the terminal and other facilities. This exercise is an essential component of the planning process and ensures adequate service levels. For example, Louis Berger performed a demand/capacity study for Arturo Merino Benitez International Airport in Santiago, Chile, determining through 2027 the maximum traffic existing facilities could handle while providing positive service levels as established by IATA. The capacity of an airport terminal is measured in peak hour passengers. Cargo areas are calculated in annual tonnage, while runway capacity is measured in peak hour operations. The master plan for any airport, no matter its location or size, is based on the projected forecasts. Rebuilding or expanding an existing airport poses different challenges than that of an airport in a new location, greenfield or both. An existing airport must continue to function during construction. Passenger processing areas, baggage handling systems, runways, access roads and other facilities cannot be shut down, but their use must sometimes be restricted to make room for construction activities. That requires an extra level of phasing in the planning and design process. There are fewer restrictions at a greenfield passenger terminal, such as the new facility at Jomo Kenyatta International Airport outside Nairobi, Kenya. The new terminal complex will include a rail link, roads and surrounding aircraft aprons. But a new site poses its own issues such as environmental protection, new road and utility access and working with surrounding property. Once the best design and size of an expanded or new airport is determined, the preferred option is selected and presented. Many stakeholders will review the plans, including the airport operator, the airlines, security interests, ground handlers and government agencies. A feasibility analysis will estimate capital and operating costs and projected revenue. Although no standard model exists for airport design, ongoing changes in technology and security promise to impact most airports. The IATA-ACI Security Access and Egress (SAE) project, for example, was created to speed processing times through security control points and reduce queuing times by using current technology and existing infrastructure. Other worldwide programmes being implemented at airports include automated border control (ABC), aimed at expediting the processing flow of low-risk passengers through international borders without compromising their integrity. IATA’s inBag project focuses on reducing the percentage of mishandled bags worldwide. The most widely known programme, though, is the Fast Travel initiative, which provides passengers with control alternatives over the journey through time-saving self-service options, including automatic check-in, bag check, document check, flight rebooking, boarding and bag recovery. These programmes and others being implemented (or piloted) are aimed at creating a ‘hassle-free’ passenger experience at airports. They do, however, present constant challenges, making airport planning and design in our era of exciting technological advances a constantly evolving practice that must keep pace with the times.